Urban design / Green building: computation of on-site wind conditions to study pedestrian outdoor comfort and to optimize natural ventilation in buildings, solar and wind resources use in architectural design. Construction: wind pressure computation for high buildings and infrastructure wind design, extreme wind analysis. Transport wind safety: extreme wind and cross wind analysis to ensure safety of high speed railway lines, roadways, cargo ships and ports infrastructures. Renewable energies efficiency: wind and solar resource assessment, passive architecture, small wind project study. Natural air ventilation inside buildings: inflows and outflows computation. Optimal size and location of openings study. Wind safety of urban public transports (along lines and platforms layout) and dockyards (wind analysis on operating cranes). 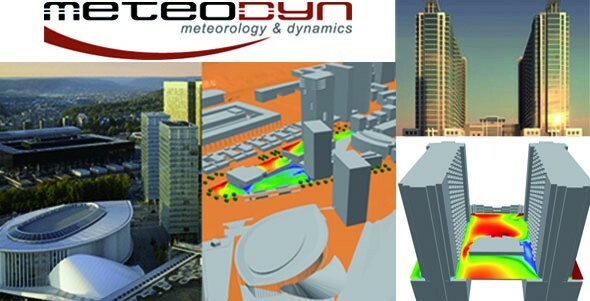 More info:www.meteodyn.com and contact us!